Pleasant, Graceful and Mature. This is how one can describe Honey Irani´s directorial debut "Armaan". Within a few minutes into this movie, you envisage a medical drama filled with real characters, some good emotions and distinguished performances. There is nothing flashy or glossy about this script or movie, just simple and yet very classy. Though the movie does have its share of flaws, the subject is tackled in a different way that reminds a lot of Meghna Gulzar´s "Filhaal". Don´t get me wrong, there is nothing in common between the two movies, Honey Irani´s treatment of the subject reminds us of Meghna Gulzar´s work in "Filhaal". "Armaan" as the title signifies is the film about one's desire and hopes and how a son goes to fulfill his father´s dream. Dr. Siddharth Sinha (Amitabh Bachchan), a philanthropist, who owns a hospital and has a dream to expand it into a state of the art hospital and is on a lookout for some funds to achieve the cause. Dr. Akash Sinha (Anil Kapoor), a respected neurosurgeon, is equally devoted to help realize his father´s dream. Enter Neha Mathur (Gracy Singh), an anesthetist, who joins the hospital as an assistant to Akash Sinha. Their cordial relation starts blossoming into love with every surgery they perform together and how they realize they have so many things in common. Enter Soniya Kapoor (Preity Zinta), a spoilt daughter of a business tycoon Gulshan Kapoor (Randhir Kapoor), a girl raised in richness but with absence of love. Soniya falls for Akash and wants to marry him. To fulfill his daughter´s wish, Gulshan Kapoor strikes a deal with Dr. Siddharth Sinha. He is ready to finance the hospital project on the condition that Akash marries her daughter. Siddharth Sinha rejects the deal. Already suffering from high stress, an unfortunate incident leads to the death of Siddharth Sinha and that leaves Akash helpless. Now, Akash has only one goal and that is to fulfill his father's dream and for this cause, he has to sacrifice the bond of love he shares with Neha. He enters into an agreement with Gulshan Kapoor and gets married to Soniya. From here on it is about the relationship between the three characters and how Akash sacrifices everything towards fulfilling his father´s dream. Through the course of the movie leading to the climax, Akash performs various surgeries and the director shows how each surgery relates to a medical victory for Akash, both as a neurosurgeon and as a human being. The script is the combined work of Honey Irani and Javed Akhtar and it does take a definite inspiration from Kamal Amrohi´s "Dil Apna Aur Preet Parayi". The medical backdrop with the love triangle between Anil Kapoor, Preity Zinta and Gracy Singh does remind of the one in "Dil Apna Aur Preet Parayi", but that is where the similarity ends. Clearly one can see that this is a feministic view of the love angle coming from Honey Irani. Having cast two big actors for her first movie, Honey Irani has come up with some neat characterization. Contrary to her male counterpart Javed Akhtar, who would cast 2 big actors opposite each other (Shakti, Trishul), Honey blends the two characters played by Amitabh Bachchan and Anil Kapoor together and the result is equally enjoyable. One could say that after a very good first half, the pace of the flick does slow down in the second half. But Honey Irani tries to give the characters (the ones played by Anil Kapoor, Preity Zinta and Gracy Singh) some more depth and tries to show their intricate relationship. Something, which totally reminds us of Meghna Gulzar´s work in Filhaal (The interwoven relationship between Tabu, Susmitha Sen, Sanjay Suri and Palash Sen). Though not offbeat, the treatment is also not the usual commercial kind and doesn´t possess the heavy melodrama or loud histrionics. 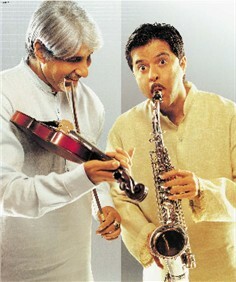 Contrary to their image, Amitabh Bachchan and Anil Kapoor play some quite different and subdued characters. The chemistry between Amitabh Bachchan and Anil Kapoor is splendid and their common scenes are the highlight of the movie. The movie and the script for itself aren´t without flaws. During the second half a lot of unnecessary sub-plots start evolving. The fourth angle of the love story provided by debutant Aamir Bashir´s character is clearly unnecessary and hinders the pace. Some of the scenes between Anil Kapoor and Preity Zinta get predictable and radically speaking, it is supposed to be Preity Zinta´s character that should have got some unpredictability in the movie. Editing by Shirish Kunder is also not up to the mark. Even though the pace of the movie can be slow, there has to be some linearity in the proceedings. Technically the movie is definitely polished and Honey Irani has worked hard on giving the movie and the characters a different look. Art Direction by Yunnus Pathan and Kiran Khanna is splendid. After doing some great work in Dil Chahta Hai, Yunnus Pathan along with Kiran Khanna have done a great job in erecting the set of the hospital and giving it the slightly ancient look. The scenes in the operation theatre or the ones showing the day-to-day life in a hospital are authentically done. Ravi Varman´s cinematography is good in some sequences, which does remind the work done by his mentor Ravi Chandran in "Dil Chahta Hai". The performances are terrific. 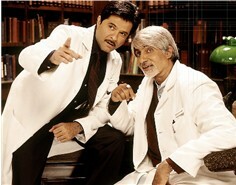 Amitabh Bachchan livens up the screen with his portrayal of Dr. Siddharth Sinha. He simply dominates the screen when he is around. His new silver-haired look is different and immensely likeable. His portrayal of a man who has seen it all in life and yet being positive is superb. Though he does have some scenes in the second half, as an audience you want more of him. The pain, the anguish and the tolerance of his character is brilliantly done by the thespian. His scene with Anil Kapoor and Gracy Singh in the car or the ones with Anil Kapoor talking about the medical profession are a treat to watch. The scene performed by him at his death is undeniably moving. The "jugalbandi" sequence between him and Anil Kapoor is the highlight of the movie and brilliantly done by both. Anil Kapoor infuses life into the character of Dr. Akash Sinha, the one of a neurosurgeon. The way he underplays his character is just superb. His scenes in the operation theatre are very very real and you can feel his pain when he uses the medical terminology when performing the operation to save the life of a patient. He performs three surgeries in the movie and at every stage, his character feels the medical victory and advances his bond with Gracy Singh. His portrayal of a man stuck between the two ladies and yet his loyalty towards his dignified father and the profession is real. Definitely a highlight of Anil Kapoor´s career. Gracy Singh shows tremendous promise and comes up with a very mature performance. If you compare the resemblance of the love triangle in "Armaan" to that of "Dil Apna Aur Preet Parayi", Gracy Singh´s role is similar to that of Meena Kumari. Though it would be unjustified to compare her with Meena Kumari, she excels in the emotional scenes and delivers a performance that will take her places. Gracy Singh is here to stay. Preity Zinta is also good in her the role of a spoilt brat turned dominating wife. Though she has a more dominating character as compared to that of Gracy Singh, her initial scenes are welcome and offer the interesting angle of the story, but later they get a little predictable. She does have the spontaneity that is required for the portrayal of Soniya Kapoor but at the same time there are several scenes where she can be accused of a little overacting. Randhir Kapoor is just about ok. Newcomer Aamir Bashir is wasted. In spite of a few flaws in the script, the movie does have some very good defining moments and will be one of the better movies this year. Some might like it for the subject and some might reject it, saying it is too slow and not up to my taste. But, Honey Irani manages to make a clean and a classy product that can be enjoyed with the entire family. The movie may not make a big impact at the box office as it clearly driven more for the classes than the masses, but the lively performances by Amitabh Bachchan, Anil Kapoor and Gracy Singh (incidentally the three doctors in the movie) and the entire well-captured medical ambience make the movie very enjoyable.